Well, we were very proud of our website, we thought it looked great, but frankly it just wasn’t working for us. It wasn’t working to generate online sales, and also it wasn’t working as a client acquisition tool. It looked great, but it just wasn’t working for us. What were you looking for in a digital marketing agency? Well, we really didn’t know until we saw Liza Choa‘s presentation, and that helped us crystallise out thinking. We were looking for somebody who would tune into our needs, tune into our rather strange business model, and understand the multi-level needs that we had to try and generate sales and also to improve our client acquisition. What did you think of the Business Acceleration Strategy? We love that business strategy. 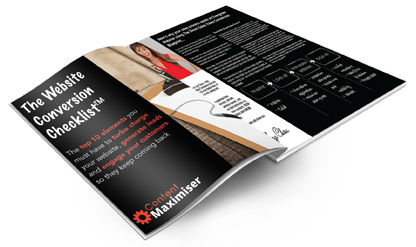 What it showed to us is that Content Maximiser had tuned into our needs, they had done their research, and yeah, it was exactly what we were looking for, for lead generation, for client acquisition, and also making the existing site a much more effective sales tool. What was your experience during the process? Very positive experience. We were very, very pleased. Everything seemed to happen on time, on budget, and some better than expected outcomes. We think it’s the best thing we’ve seen in our industry. We’ve already shown it off to our world-wide group and they love it as well. It’s early days yet, but we’re very, very positive that it’s going to work really well for us. Would you recommend Content Maximiser to other businesses? Absolutely, as I said before, they delivered on time, on budget, and we’d be really really proud to recommend them to other businesses similar to us.